Today is the official, nationwide release of the long-awaited Furious7. Though April is not typically a blockbuster movie month, industry experts are predicting a record-breaking opening for this much anticipated, seventh installment of the movie franchise. I have a confession. I have never seen any of the Fast & Furious movies. Nope. Not even the first one. Understand it has little to do with the movies themselves. Between the cars, the action and, let’s face it, the actors, I’m pretty sure I’d like the movies. I’m just not that much of a movie-watcher. What has brought on this sudden interest? To be perfectly honest, I was simply trying to do some research on the cars. Now I’m hooked. Thank you, Dennis McCarthy and team for casting and designing a spectacular vehicle lineup. Of course, my first fascination was with the off-road Dodge Charger. A what? Who? Huh? Yes, it’s true. 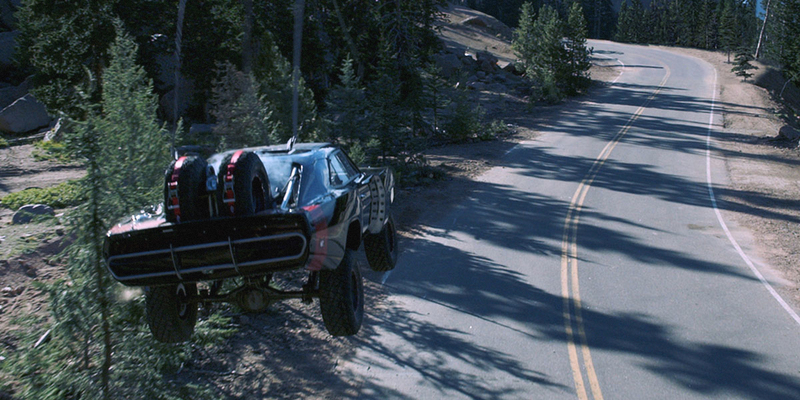 McCarthy’s favorite of the Furious7 vehicles that he cast and designed, the off-road Charger had a roll-cage and huge tires and was finished just in time to be shipped off to various set locations. And then dropped off a cliff. Then there are the parachuting cars. (If you’ve seen the movie trailer, you know exactly what I’m talking about.) In an effort to keep things realistic, they actually did drop the cars out of a plane three times…minus the engines and fluids. After all, that would just make things a little too messy. Recreating a $3.4 million Lykan Hpersport would be challenging in mind-boggling ways. Recreating 10 of them (keep in mind only seven of the real thing exist in world), is unthinkable. Unless you’re McCarthy. Then it’s just another day in the office and doing so is necessary because Dom (Vin Diesel) is going to drive one of those creations through a skyscraper window, fly through the air, break through the window of a neighboring skyscraper and jump out of the car before it then crashes through the other side of THAT building and fall to its demise. WHEW! Yup – just another day in the office. Furious7 utilized 340 cars, of which 230 were trashed during the filming. Given that only about 10 percent of the film’s stunts were CGI, that is some pretty intense metal-on-metal, flying metal and metal-meets-concrete action. I could go on – there’s a Maserati Ghibli, a McLaren, an Audi R8, a Bugatti, and of course Dom’s lineup of Mopar classics. But sadly, I’m out of time for today. So, until next week, AFTER I’ve seen the movies…enjoy the show!